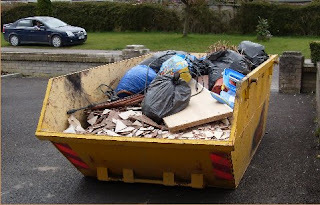 What is it about having a skip in your driveway that makes you consider life and the accumulation of goods? Or is it only me who thinks "Lets clear the clutter and fill the skip". Our road had a number of skips last week, some kind of clearing coincidence not unconnected with the season no doubt. Ours was half filled with broken tiles, smashed plywood, odds and ends of delf and a smashed up dresser or kitchen unit as we used to call such items. We did invite the neighbours to add their rubbish as well and they did. There should be a communal element to such a traumatic celebration as skip filling. I'm sure anthropologists could tell us of remote communities still bound by the niceties of good neighbourliness who make the filling of a skip a week-long local festival with much sharing - drink, home baking, singing and dancing. The most difficult decisions are not the large items. Yes the dresser had to go, the tiles obviously also but that cup that was all the remained of the dinner service we got as a wedding present from a long deceased aunt and uncle - that can be difficult to finally jettison. And what about the assorted remains of the various sets of crockery we bought over the last quarter century, must they go? Yes they must! An audio slideshow of the tribute to Seamus Heaney at Poetry Now is available on the Irish Times website here. Poetry Now over for another year. I attended the final reading yesterday, Sunday, afternoon, three poets - Adam Foulds, Colette Bryce and Carol Ann Duffy - three different styles of delivery. Adam Foulds' debut book of poetry, The Broken Word (Cape), a poetic sequence set at the time of the Mau Mau uprising in Kenya, was published in 2008, and won the Costa Prize for Poetry. Apart from thanking the organisers and saying how much he enjoyed being in Dun Laoghaire he did no introduction but read sections of the poem without comment though Joe Woods, who introduced him, had spoken sufficiently about the theme and scope of the poem. His reading worked well because of the clear narrative in the poem. Any introductions to particular sections would have been an unnecessary break in the flow. The form and content, narrative with dialogue and conversation allowed a dramatic reading which impressed the audience. Colette Bryce, born in Derry, has published three collections of poetry: The Heel of Bernadette (2000), The Full Indian Rope Trick (2004) and Self-Portrait in the Dark (2008). Her reading had a different tone to it, more the cosy familiar family gathering in the sitting room. Her introductions were chatty and friendly. She mixed old and new poems, starting with a long new poem about growing up in Derry. The audience felt very comfortable with this, recognising familiar placenames, incidents and episodes. She read poems from her other books, including one with the unlikely setting (for a poem) of a carwash. Carol Ann Duffy is one of Britain’s most popular contemporary poets and is also an acclaimed playwright. She has been tipped to be the next UK poet laureate. The most experienced of the three, she gave a lesson in poetry reading. She started by saying that she would begin with poems which were fun to write and end with poems which were not fun to write. The "fun" poems were three from her The World’s Wife collection where she writes in turn as the wife of Midas, Tiresias and Faust. Witty, conversational, colloquial with wonderful use of rhythm and rhymes these enchanted the audience. The "not fun" poems were from her collection Rapture mostly sonnets with one word titles chronicling a love affair. A different tone to this part of the reading but just as accomplished. A most enjoyable day to end a most enjoyable festival. By all accounts Saturday, which I missed, was also full of wonder especially the birthday celebration for Seamus Heaney who was present at most if not all the events I attended. which was shortlisted for the Forward Prize. She lives in Bremen, Germany. She read, and writes, with the confident voice of someone who has seen the world through many eyes - native, outsider, traveller. You can hear her read at the Poetry Archive here. Paddy Bushe was born in Dublin in 1948, and has lived in Co. Kerry since the early 1970s. 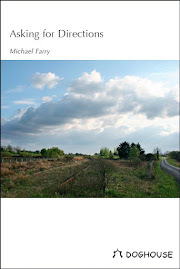 He has published eleven books of poetry in English and Irish. 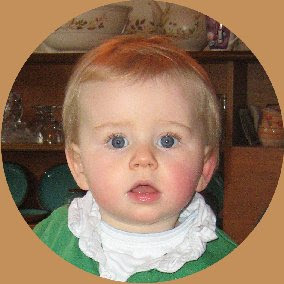 He positions himself solidly in the traditional Irish tradition. He read extracts from his translation of Caoineadh Airt Uí Laoghaire, some poems in Irish with his English translation and a poem to Cathal O Searcaigh, written as a result of a visit to Nepal where he spoke to and filmed some of the boys who featured in the controversial film Fairytale of Kathmandu. Paul Batchelor was born in Northumberland in 1977 with a Scottish background. His debut collection, The Sinking Road (Bloodaxe) was published in 2008 and was shortlisted for the Jerwood Aldeburgh Prize and a Glen Dimplex Award. His poems and his reading were very impressive - good introduction, touches of humour, good audience awareness. He has included some translations from the Irish Buile Suibhne in his collection. You can hear Paul reading six poems from his collection here. The poems are: 'Artemis', 'Keening' (for Barry MacSweeney), 'Secret Papers'. 'Honesty', 'Suibne in the Trees' (from the sequence 'Suibne Changed'), and 'Finding', a five-part poem written for his grandfather recalling the time during the 1930s when he worked in Kielder Forest in Northumberland. 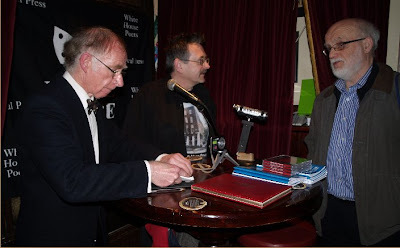 Harry Clifton was born in Dublin in 1952 and has published six collections of poems. His most recent collection, Secular Eden: Paris Notebooks 1994-2004 (Wake Forest University Press), won the 2008 Irish Times Poetry Now Award. He teaches at the School of English, University College Dublin. His reading was very assured. His introduction and poems revealed a poet who has wandered through and lived in many parts of the world and engaged with each place on its own terms. This afternoon three more poets reading at 4pm - Adam Foulds, Colette Bryce and Carol Ann Duffy. The highlight of last night's two reading sessions at Dun Laoghaire Poetry Now Festival was Tomas Venclova's reading which finished off the second session. Born in Lithuania in 1937, here was someone who was a participant in, rather than a link with, that great dissident literary movement in middle and eastern Europe of the last century. As a young poet he met and translated Anna Akhmatova and Boris Pasternak and was involved with Joseph Brodsky and others in the Lithuanian and Soviet dissident movements. He was exiled in 1977 and has lived and has taught in the USA since. He was a wonderfully live presence on the stage. He spoke excellent English with a marked eastern European accent. He introduced all the poems himself, read some in Lithuanian and two others read the English versions. In some cases then we heard Venclova's introduction and the English version only. If that sounds awkward it wasn't. His poems were not oppressively political, not exclusively focused on the oppression of the past but finely balanced between the general and the specific, the personal and the public. and poetry is more meaningful than dreams. Another poem, "For an Older Poet", dealt with his relationship with his father, a poet who became a "Soviet poet"and with whom he had a difficult relationship. His poem "In the Lake Region" is an understated consideration of "a peaceful corner of Europe between Wansee and Potsdam". Wansee is where Hitler's "Final Solution" was comfirmed and Potsdam is there at a conference Churchill and Roosevelt agree that Russia would have influence over the states of eastern Europe, including Lithuania. This is a place "where much has happened, but, probably, nothing more will". Venclova's readings of his poems in Lithuanian were the highlight of the event. I didn't want to hear the translation read. He has a striking reading style, helped by the fact that I had never heard Lithuanian being spoken before. It was wonderful. Do we really need foriegn language poetry translated? If he had come out read all his poems in Lithuanian with an English introduction I would have been delighted. I suspect many more in the audience would have been also. Some of his poems can be read here. Interview here. More here. 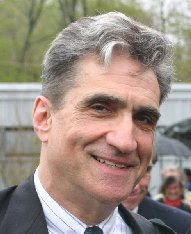 Robert Pinsky - "The Fate of the Modern"
I attended the Dun Laoghaire Poetry Now Festival keynote address last night by American poet Robert Pinsky. Entitled "The Fate of the Modern" it was a most wide ranging, at times detailed talk which I enjoyed immensely. It is impossible to summarise such a performance and indeed it should be impossible. I'll just mention some of the points made and poems referenced by Pinsky. You can read some comments by Pinsky on this poem and hear him reading it here on Slate magazine. Modernism, Pinsky seemed to say, is a means of dealing with the past which is different from the traditional excessively respectful way. It involves remembering and forgetting - two aspects of the same activity. It is a way of changing ghosts into ancestors. As examples of poems which exemplify this modernism he read To Elsie by William Carlos Williams. You can read the poem here and hear Williams reading it. He also read the last section of A Supermarket in California by Allen Ginsberg noting how it ended with an echo of Landor - the image of the river of forgetfulness, Lethe. This poem is available to read and hear here. worship our ancestors: we consult them." And he finished with the last poem from the same volume "From the Last Canto of Paradise" which is as it says a translation of a small part of canto 33 of Dante's epic. You can see and hear him read the same poem here. New York Times review of Gulf Music here. The Poetry Now Festival continues today. Two magazines, Poetry (USA) and THE SHOp dropped in the letterbox yesterday. No time to do much more than browse them yet but of note is the fact that Irish poet Conor O'Callaghan, Dundalk native or one time resident there, has three poems in Poetry. (Nice to see a typo in his bio, it's reassuring to see this happens in more prestigious magazines as well as in Boyne Berries). Conor is also featured in the magazine podcast. Interesting letters, comments and reviews in the same magazine but more on them some other time. THE SHOp has a fine collection of poetry from some very well know names including poet Barbara Smith who was a fellow highly commended at the recent Caomhnu Cavan Festival. Also there I see two poems from Miriam Darlington who was at the 2007 Arvon Lumb Bank course I attended. Last year Harry Clifton's collection, Secular Eden: Paris Notebooks 1994-2004 (Wake Forest University Press), won The Irish Times Poetry Now Award last year. This year's Award shortlist is Colette Bryce Self-Portrait in the Dark (Picador Poetry); Ciaran Carson For All We Know (Gallery Books); Leontia Flynn Drives (Cape Poetry); Pearse Hutchinson At Least For A While (Gallery Books); Derek Mahon Life on Earth (Gallery Books). Robert Pinsky gives the Poetry Now Keynote Address, The Fate of the Modern, tonight at 8.30 pm. From 1997 to 2000,Robert Pinksy served an unprecedented three terms as Poet Laureate of the United States. Pinsky will talk about how what he calls the “mighty tide” of modernism sets an example of poetic commitment and engagement to meet the challenges from a cynical age. I hope to be there. There has been discussion recently as a result of the Cork based magazine Southword deciding to cease as a print magazine and become an online magazine only about the decline in the numbers of print based literary magazines. Since our Writers Group publish a magazine with poetry and prose I'm interested in other similar small magazines. Ireland does not have many of these but the UK has a large number. In the most recent issue of Boyne Berries we published a poem by Les Merton who is the editor of Poetry Cornwall/Bardhonyeth Kernow and as a result I got a copy of the most recent issue of Poetry Cornwall. This is published three times a year and the latest issue is issue 24. It costs £3.95 and has forty pages. Poetry Cornwall accepts poetry from around the world. There is an interesting mix of poets, styles, and subject matter, this issue has around 70 different contributors. While the magazine has a local Cornish bias with at least half of the contributors based in Cornwall it does have a number of contributions from elsewhere in the UK and some from other parts, Switzerland, at least four from the USA, one from Poland represented. There are none from Ireland in this issue but the editorial does mention that poetry in Irish has been published in the past. The poems are a real mix of styles and forms. There is a nice mix of rhyming forms and free verse. Topics are not in any sense exclusively Cornish even among the contributors from Cornwall. Some items that caught my eye include "Fuschia Hedges" by Isabella Strachan - "They run beside us /like curtains whipped along their tracks" and another take on the digging metaphor for writing poetry in "Digging" by Peter Day - "poets dig into/ the squirming world". Unlike many magazines where there is a one poem per page rule this magazine fits as many as possible per page. 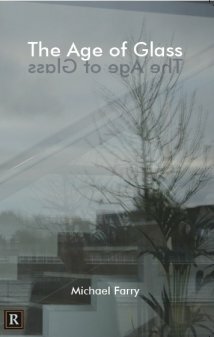 One nice feature of the magazine is the number of short poems including some haiku that are included. Each poem has to fight for attention on the page. The publication has the feel of a magazine with a number of features rather than just a collection of poems. There is a regular Meet the Editors feature which in this issue deals with the Dawnthreader quarterly literary publication which specialises in myth, legend, lanscape, nature, spirituality. Its editor is Dawn Bauling. Les Merton, poet is the editor and in his editorial he points out that he has published poetry in a language other than English. He lists an impressive number of languages which have been published in the magazine. 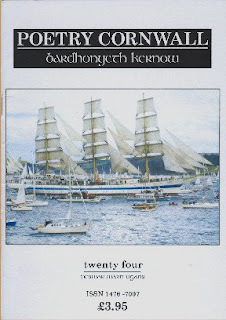 These poems are translated into English, and the Cornish language Kernewek. 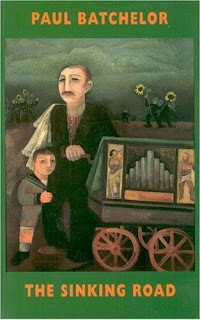 In this issue the other language poem is in Yiddish by Lev Barinski. There is also a poem in Cornish by Tim Saunders. The magazine's website has details on purchasing, subscribing and submitting. Bob Dylan and his Band started their European tour with concerts in Stockholm on Sunday and Monday nights. The setlists have been rich with old favorites and rarities but the highlight occurred the first night when Dylan broke out "Billy", a song he never before played live. The performance, audio only, is on YouTube at the moment. This song was part of the soundtrack for the 1973 "Pat Garrett and Billy the Kid" Western directed by Sam Peckinpah and starring James Coburn and Kris Kristofferson. 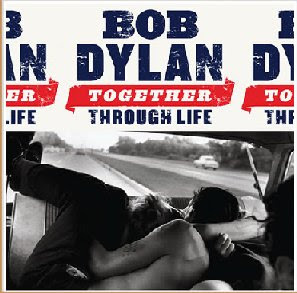 Bob Dylan, who acted (though that may not be the correct word in this case) composed multiple songs for the movie's score and the soundtrack album was released the same year. He played seventeen songs each night and of these fourteen were different the second night. This tour ends in Dublin on 5th and 6th of May. I'll be there both nights and maybe at a UK concert as well. Tour details, set lists and reviews here. The other Dylan news of course is the new album. More details are trickling out. The album title is Together Through Life. The release date in Europe is Monday, 27 April. The cover artwork is a photograph by Bruce Davidson. Dylan's 46th release is his first studio album since 2006's Modern Times and it's making was prompted when he recorded a track "Life Is Hard" for the forthcoming film ‘My Own Love’, starring Renee Zellweger and Forest Whitaker. Comments after a first listen here. Best site for all Dylan news is expecting rain. My primrose has appeared again. Lots of daffodils and crocus showing off, tulips and bluebells on the way but the appearance of the single primrose is an event. I bought seed from the well known suppliers, Barnhaven Primroses, sowed it and waited. Primroses are not easy to grow from seed and nothing appeared for a few years. Then last year there it was - a primrose. This year in fact I have two primroses, another has appeared. Something very reserved, shy, fragile about the primrose, possibly to do with that pale shade of yellow. 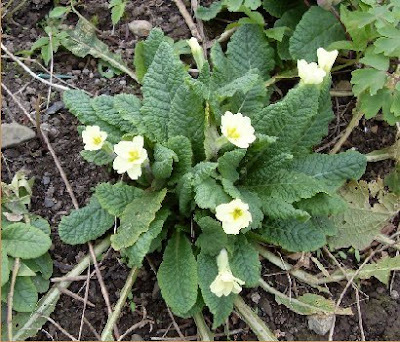 A number of good poems about primroses also including ones by Coleridge, Donne and Kavanagh. Mention of Kavanagh reminds me that the annual poetry weekend organised by the Patrick Kavanagh Centre in Inniskeen, Monaghan takes place from Friday, 24th to Sunday, 26th April 2009. 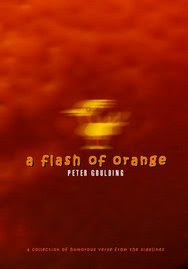 Peter Goulding is launching a collection of his humorous poetry “A Flash of Orange” next Tuesday 24th March from 7.00 – 8.30pm in Blanchardstown Library, Dublin 15 (opposite UCI) The book has a foreword by RTE’s John Creedon and a cover design by Paul Fegan. Peterwas a prizewinner in last year's Swift Satire Competition which we organised for the Swift Festival in Trim. You can read his poem here. 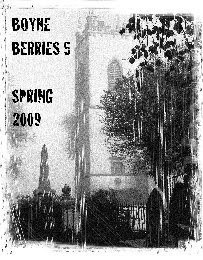 We also published one of his "serious" poems in Boyne Berries 4. He attended and read on the night. and he is also has a regular column in The Community Voice newspaper, for whom he also writes the Arts pages. A keen supporter of League of Ireland football, he is poet in residence at Shelbourne FC. Unfortunately I won't be able to attend as it clashes with our Meath/Cavan LitLab meeting but best of luck Peter. This poem is included in the latest issue of Boyne Berries. It was written in response to numerous arguments in our writers group as to what exactly defined a poem. It was awarded second prize in last year's Goldsmith Poetry Competition. The judge was poet Jean O'Brien who herself won the 2008 Fish International Poetry Award. staring at me through spokes, then dying. I searched all week but never found the grave. I’m sorry, I’ve forgotten. What is the question? In fact that bit about my father is not true. was alone there, curiously watching, helpless. I was too young for that responsibility. or at his field of hay near Finnegans. watching, saw me, wondered what to say. refused to drain - my childhood playground. in which I was born, well into June. Pat Dunne performed the launch and gave an interesting, at times amusing, account of his writing career from school boy days to the present. His novels have been translated into eleven languages. He complimented the group on the magazine. We had sixteen readers who read their contributions. All were appreciated by the audience. What was especially impressive was the range of styles and content. Tony Bailie came from County Down to read his poem "Wake", Geraldine Creed from Dublin read her story "Vis a Vis", Brid McDonnell and John Noonan from County Louth read their poems. Sales were good and we even had an offer of sponsorship for future issues. All in all a great night, good feeling that another magazine has been completed, contributors are happy, we have an audience for readings and we can look forward to the next issue. In the meantime there's the Swift Satire Competition and the Boyne Readings/Open Mic event to organise. At last the boxes containing the latest issue of our group's magazine Boyne Berries have been collected from our printers ePrint and are safely in my possession. So we actually have something to launch tomorrow night. We expect about eighteen contributors to be present to read their pieces and who knows how big of an audience. We usually have 50 to 60 people but there is always the doubt that this could be the flop with few present. Pat Dunne is going to do the official launch. He is a Trim born internationally-selling author with four novels published to date. His novel, A Carol for the Dead, the first in a series of thrillers featuring the Meath-based archaeologist Illaun Bowe, has appeared in paperback in English and in addition has been translated into eleven other languages. We look forward to his contribution to the night. The cover by Greg Hastings based on the churchyard at Tara looks very well. It's the first of a series of four, that's if the magazine can keep going for three more issues. We publish twice a year, no problem getting submissions the problem is finding the money to produce it. We got a small grant from the Meath Arts Office last year which helped. Anyway we're looking forward to tomorrow night, good prose and poetry, friendly faces and the company of fellow writers. All welcome, no admission charge. Castle Arch Hotel, Trim 8pm. To mark the day why not listen to and look at John McCormack in colour in an extract from a film of 1936, Wings of the Morning. This was the first British Technicolor film and starred Henry Fonda. Its plot was intricate, set in Ireland during a span of 50 years, involving gypsies, horse racing, and life amongst the gentry in rural Ireland. McCormack made a cameo appearance as himself in an informal concert sequence unrelated to the story. He carries the black notebook which he usually used at concerts. The three selections were filmed during the summer of 1936. Here is an earlier film of McCormack singing Ireland Mother Ireland in 1920. At the piano Edwin "Teddy" Schneider who was McCormack's faithful accompanist. Because it is the eve of St Patrick's Day I thought you might like to hear an Irish song sung live by Bob Dylan. 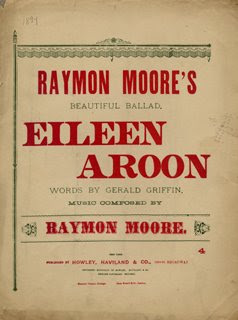 The song is "Eileen Aroon" which he performed live at 11 show s in 1988 and 1989 at the start of his "Never Ending Tour". Here is audio of a performance at Jones Beach Theatre, Jones Beach State Park, Wantagh, New York 30 June 1988 . He usually included a traditional style song in his sets at that time. He never recorded the song as far as we know. Presumably he learned it from the Clancy Brothers who had recorded it in 1961 on their LP Clancy Brothers & Tommy Makem. Text of the version sung by Dylan and more information here. Boyne Writers Group has just announced details of their 2009 Swift Satire Competition for satirical work (prose or poetry) in commemoration of Jonathan Swift. This competition is being held in conjunction with the Trim Swift Festival, which takes place in Trim from Thursday, July 2, to Sunday, July 5, 2009. Entry fee: 7 Euro (or 5 pound sterling or $10) per entry. There is no limit to the number of entries, but each must be accompanied by the said fee. Cash is acceptable. Entries can be made online. Full details on the Group's website here. Length: Prose: minimum of 600 words, not more than 800 words. Poetry: minimum 30 lines, maximum 100 lines. Prizes: 1st 500 Euro, 2nd 300 Euro, 3rd 100 Euro. Closing date: Friday, 5th June, 2009. Last year's inaugural competition and festival was a great success. you can read last year's winning entries here. This poem was written as a result of finding one sunny Saturday morning that the rear window of my car had been broken during the night. 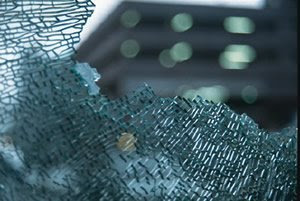 Life is too short to worry or get angry about these small things especially when insurance covers it and the new glass is fitted on the spot. Is it just my imagination or was there more cold weather when we were young? Smashing ice on puddles in the pot-holed pre-tarmacadamed roads was always a pleasure then. What the Guardian describes as the first of a series of collaborations between poets and photographers, poet Sarah Maguire and photographer Martin Argles present an illustrated performance of Sarah's poem, 'My Father's Piano'. The poem is from her most recent collection "The Pomegranates of Kandahar" (2007), which was shortlisted for the 2007 T. S. Eliot Prize. Text of the poem here. 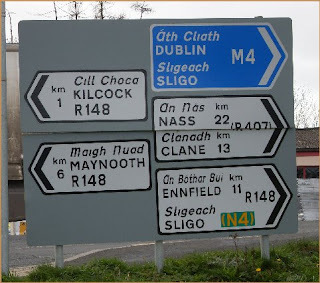 There's the added interest of the Irish placenames and the variations in spelling which sometimes causes letters to the editor. This sign is delightful for two reasons: the misspelling of NAAS and the probable misspelling of Enfield. both are understandable, two "A" together in an English word - never! The original name for the second town appears to have been Innfield and this is still seen on signs and addresses. It was changed to Enfield probably because of the English place. This misspelling is a confusion of Innfield and Enfield and seems to be a once off. This week end a Silent Film Festival is being held in Killruddery House which is situated 20 kms south of Dublin, just beyond Bray in Co. Wicklow. The full programme is varied and interesting, these are some of the highlights. Friday 13 March: Down Wicklow Way, Programme from the IFI Irish Film Archive / 6.15pm / €15. Sunniva O’Flynn (Curator of the Irish Film Institute) will present a selection of silent films made in and around Wicklow in the 1920s, 30s and 40s which are now preserved in the Irish Film Archive. Live piano accompaniment by Josh Johnston. Saturday 14 March 11.00am: The Adventures of Prince Achmed made in Germany in 1926, 60mins, € 15. Lotte Reiniger’s elegant masterpiece is acknowledged as the first ever animated feature and uses shadow animation to tell a captivating story of kind ogres, magical flying horses and wicked magicians. Live piano accompaniment by Stephen Horne. 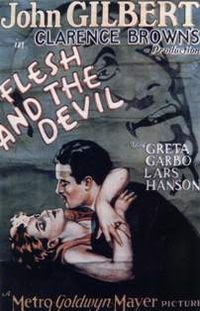 Saturday 5.30pm: Flesh and the Devil by Clarence Brown made in the U.S.A. in 1926, 112mins, €25. One of the few films to capture completely the magic of Greta Garbo, this film depicts a passionate romance between Garbo and John Gilbert (a romance that was also playing out in real terms). Live musical accompaniment by Stephen Horne. Saturday 8.15pm: Sunrise Made in the U.S.A in 1927, 96mins, €25. Murnau’s magnificent film is not only one of the masterpieces of the silent period but is one of the most remarkable films ever produced. It screens here with its original score. Sunday 15 March 4.00pm : Talk ‘An Introduction to the Silent Era’, 60mins, €20. An illustrated introduction to the silent film period with Special Guest to the festival Mr. Kevin Brownlow. I probably won't make any of it in spite of being retired. Retirement is . . .
. . . being able to watch most of a five day cricket test match. Especially when the time difference is advantageous as it is when the match is in the West Indies. They're just off in the final day's play in Trinidad with the match finely balanced. I see a cricket test match as the epic of the sporting world, the Paradise Lost and Paradise Regained in one go, the Divine Comedy as against the lyrics of football matches or athletic events. The strange thing is that while we see cricket as the typically English game, other countries have taken to it so well, West Indies, India, Pakistan, countries whose stereotypes would be opposed the the English stereotype. All national stereotypes are to be resisted of course. There is also some doubt as to the national origin of cricket, see today's Irish Times and this article. I had expected some more cricket poetry to be available but it seems scarce. Some here and here. Picture is of the great Shivnarine Chanderpaul of the West Indies, an antidote to the loud, flashy cricket type he is slow, careful, steady, methodical. The latest issue of our magazine, Boyne Berries, has been put together and sent to our printers. 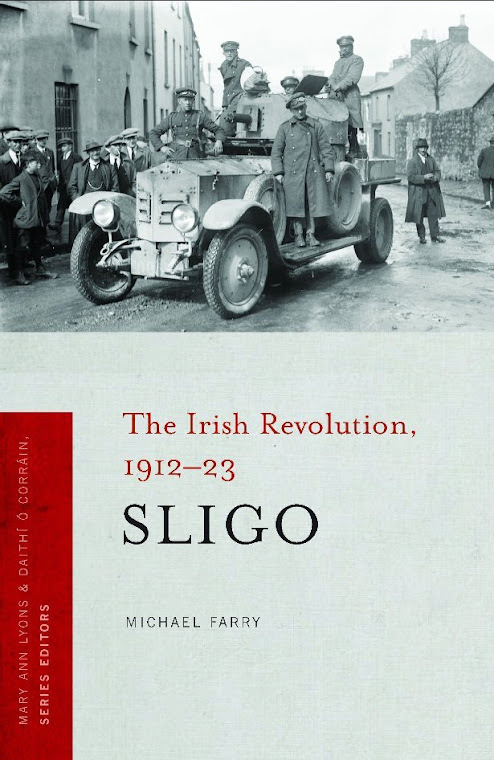 The launch is planned for Thursday March 19 in the Castle Arch Hotel, Trim at 8pm. Trim born novelist Pat Dunne will perform the official launch on the night. Pat is one of those behind the Swift Festival in Trim. Everyone interested in writing is welcome to attend the launch. Especially welcome are the writers who are included in the magazine and they are expected to read their pieces. We usually have a very enjoyable evening with fifty to sixty people present. The cover is as usual designed by Greg Hastings. After four covers based on images from nature this cover sees a change. This cover image is based on the church and churchyard at Tara, Co Meath. 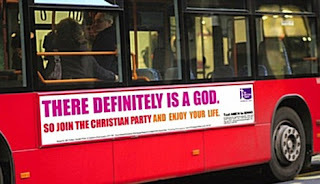 The believers fight back against the atheist bus adverts. News stories here, here, here and here. At least it's a positive statement rather than the atheist's "probably" though the certainty itself has drawn criticism. Difficult to get it right of course. What about something like "I'm absolutely certain that there probably is a God". You can download a part of a recent Leonard Cohen concert at the Beacon Theatre, New York, February 19, 2009 at this site. Scroll down it's on the left. It includes Hallelujah. tell you stories of Knocknashee. fairies and (of course) a donkey. Written for my grandchild Cian. I always enjoyed making up stories for my children sometimes told by the light of an old oil lamp from Sligo. Knocknashee (the hill of the fairies) is a hill in south Sligo. 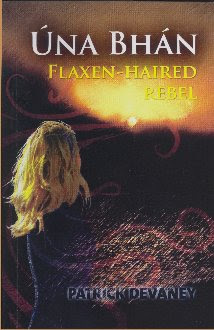 Pat Devaney, a native of Co Roscommon, who now lives in Virginia Co Cavan has just published a second historical novel called "Úna Bhán, Flaxen-Haired Rebel". Pat is a member of the Meath/Cavan Arts Offices LitLab project and recently had a poem highly commended in the Cavan Caomhnú Competition. He has written four novels for teenagers: "Rua the Red Grouse", "The Stranger and the Pooka", "The Psychic Edge" and "Tribal Scars" and has had two collections of his poetry published, "Searching for Updraughts" and "Swan Pendant". His first historical novel "Through the Gate of Ivory" was published in 2003 by Lilliput Press. Many will have heard the legendary tale of Úna Bhán MacDermot of Moylurg and her ill-fated love affair with Tomás Láidir Costello. Her father refused to allow them to marry and Úna died of a broken heart. Tomás used to swim to Trinity Island to keep vigil at her grave, resulting in his death from pneumonia. He was buried beside Úna and two trees grew over their graves, when entwined to form a lovers’ knot. troubled young woman who demands to be treated as an equal in the male dominated world of 17th century Ireland. She became a rebel committed to driving the foreigners out of Ireland. Textbook accounts of the defeat of the Irish at the Battle of Ballintober in 1642 tell of a soldier pulling a cap from the head of a fallen Irish fighter revealing the concealed long tresses of flaxen hair of a woman. In his account of the battle, Pat Devaney identifies this woman as the dying Úna Bhán. The narrative combines fine story-telling, written in an easy, pacy manner with vividly described events and characters. The novel is available in bookshops in Cavan and Meath and online in a number of places including here and here. A review of the novel in the Anglo-Celt newspaper is here. My reading at the White House Revival went very well last night. A good crowd, a nice selection of open mic poets with varied styles and themes including Boyne Writer Paddy Smith who accompanied me to Limerick. I read for almost a half an hour to an audience of about thirty who were very attentive and responsive. Paddy is my reading advisor and I took his advice on introductions telling just enough to allow listeners to appreciate the twists of each poem. The whole atmosphere is very friendly and supportive. Dominic and Barney are very good hosts and the local poets have a chat about poetry, writing and life in general. They really make you feel at home. The ever efficient Dominic has already put a slideshow of pictures on his blog here (Choice of music appreciated!) and a video of me reading two poems on YouTube here. Thanks Dominic. Back in Trim after 3am. Writers Group meeting tonight. We plan to start an open mic here in April. After last night I am even more enthusiastic about it. Above: Barney, Dominic and myself. White House Poetry Revival reading tonight. Outfit chosen, route planned, set list finalised. Twenty five-ish minutes of poetry and introductions. A folder which includes must reads, maybe reads, and read only if they scream for more. Dress rehearsal went well, the dog responded well to most of the poems but very few tail wags. He didn't like the effort at comedy but I thought his reaction to it was a little overdone. Ah well those new tiles are very easy to clean. More on yesterday's U2 blog here including a video of an adapted U2 song. Protesters have demonstrated outside the Irish Department of Finance against U2's decision to move their tax affairs to the Netherlands to avoid paying tax on their royalties in Ireland. The protest was organised by the Debt and Development Coalition Ireland (DDCI) which campaigns on issues related to the developing world. The coalition contains such organisations as Concern Worldwide, Trócaire, Oxfam and various Catholic missionary orders. U2 moved their publishing arm to the Netherlands in 2006 after the Government capped tax-free earnings for artists at €250,000. Previously, U2 had been one of the biggest beneficiaries of Ireland's tax-free status for artist royalties. News items here, here, here, here and here. So are they a business or are they artists? New U2 album reviewed here. Two coats, four hour gap. Porcelain? What kind of a colour is that? One of these off white colours - the new magnolia. and red and blue. Real colours. Real taste. but still insipid, drab, bland, tame, vapid. Vapid? A thesaurus is a wonderful thing. for a Last Supper or a Last Judgement. in the Camposanto, in Pisa last September. still a few glimpses left. 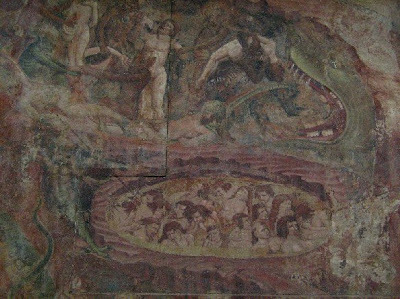 Hell and the devils a real work of art. 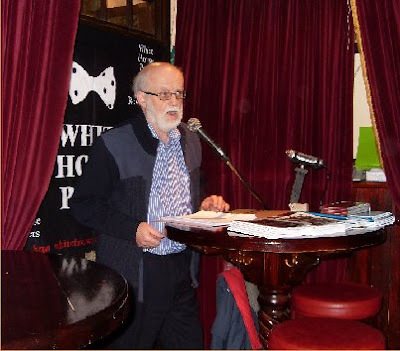 I'm the featured reader at the White House Revival Poetry reading in Limerick on Wednesday next. I'm putting together my "set" for the event. Difficult to choose poems. Greatest Hits? The latest masterpieces? It's a daunting gig with a history of fine readers. I visited there last November and read two poems in the open mic. They do the open mic section first then the featured writers. This means that the audience has heard quite a number of poems already and the standard has been set to challenge the guest. A bit of humour in the poems would go down well but I'm afraid humour is scarce in mine. Something to think about for the future. Then there's the introductions. "This poem needs no introduction" is pretty bad. The audience who will hear the poem once need to be prepared so that they get full value form the reading. On the other hand you can't tell them all about the poem, no point in reading it then!